No more books in paper but Kindles! 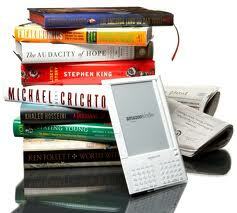 Did you know you can borrow a kindle from our library? I love technology, innovation, social networks and blogs but when the time comes for a break I need a book. Books are part of my life. I belong to the group of old style readers who love faded vintage and yellowish pages that bear the signs of previous readings (including notes, highlights and underlines!). However, and to my own surprise, I truly enjoyed the Kindle - a new “toy” to read books, amazing! How did I get it? Actually before leaving for my summer break I requested a book and some research material from our library. Instead of getting books, to my surprise, Sundeep – our librarian - gave me a Kindle. Lighter than a book, the Kindle has enough memory to store many books and in fact the one prepared for me had books, articles, lots of reference material which was useful for my research. And it was easy to use! I was able to search by author, by title, key words, add my bookmarks and all with one tablet. I really enjoyed it, the only negative thing is that: when you start enjoying it, you need to return it to the Library as others colleagues are waiting for it! A new era for library users has began, thanks COM for implementing such a great tool.